Does your tie have a past life? Wood ties from the craftsmen at Wood Thumb in San Francisco do -- maybe as a beam holding up a barn, floorboards from an old warehouse, or siding from a dismantled sawmill. Founders Christopher and David Steinrueck put their creativity and inspiration to good use, turning waste materials into wearable products. From a neglected old redwood beam, sitting in a salvage yard, the two brothers created their first wood neckties. Wood Thumb ties are lightweight and flexible, held together by a cord that runs through the segments of the tie and around the shirt collar. Nail holes and rust spots add character and hint at the storied history of the salvaged wood. Part woodsman, part urban renegade, the net effect is a cool statement piece that’s definitely a head-turner. 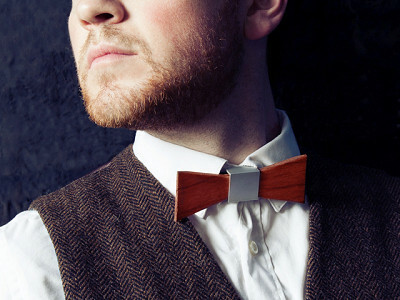 Wood ties -- they’re not just for railroads anymore. So, if I give one to a guy am I giving him a "woody"? @Bethy: And a stylish one, at that, Bethy. My brother likes the look of these, but he's wondering about the noise factor~ do these ties clatter a lot while you're wearing them? @Emily: Not at all, Emily. Our ties manage to be stylish, lightweight, and comfortable, all while being silent as a church mouse. Unless of course, like me, you continually fold up the bottom piece and tap it against the rest of the tie. In that case, it makes a satisfying "clap, clap, clap." @Emily: I'd add that the wood pieces are all connected with a piece of elastic that keeps them snug & not knocking into eachother...so the tie makes no noise on it's own. I'd love to purchase one of these ties. (perhaps even a few of them!) My only concern is that the colors seem to vary greatly from light yellow to deep reddish brown. I'd love to pick my color before committing to a purchase and potentially receiving a color that may not match well with my wardrobe. The option to choose at least a color range (since I can't pick my tie out in person online) would be of great value to you, Wood Thumb! Please add that to your online shopping cart and I'll be first in line to make a purchase. Keen eye, Ryan. In the video you'll notice a number of lighter or "blonde" ties, like the one our lovely model, Rebecca, is wearing early on. These ties were earlier prototypes, made when we were still playing around with different varieties of wood. Any tie ordered now will be made from reclaimed redwood, so while there is still some natural variation in color and pattern (each tie is unique, after all) none of them are as light as those earlier ties. Great gift for the son-in-law that hasn't quite figured out how to tie and is hip with the ant-tie establishment. The guy is 6'11 any chance on a XL option? @Brian Cutler: Down the line, we hope to be able to offer sizes from kids to XL, but for the moment, Brian, I'm afraid we only have the two sizes available and no immediate plans to offer an XL. Our large ties are 21.5" long and fit my 6'4" brother David pretty well. I have questions along the lines of previous questions asked. I, too, have a tall son-in-law, 6'9", who may need a longer version. I could find out the length needed. Do you do custom versions? Also, we have family in and near San Francisco, so we visit from time to time. Do you have a store or stand where we could visit and choose ties in person? I love your wood tie idea! @Karyn Bush: Karyn, we're not offering an XL at this time, and our current demand doesn't leave us enough time to build custom ties right now, but our larger ties are 21.5" and they fit a range of heights. We are available in a number of stores in San Francisco, though I don't have the list in front of me. If you're looking for something specific, e.g. lighter or darker, knotty or grainy, we're happy to try and accomodate that. You can include a comment in "Gift Message" Field here on Daily Grommet. Christopher will be back soon with information for the tall guys in your lives! I am in the process of curating the museum's annual holiday exhibit, Holidazzle. I would love to invite your "ties" to the show. This is a selling exhibit. I would love to discuss further... email address above. @David McGuire: I have forwarded your note and information on to Christopher. Thanks for stopping by. 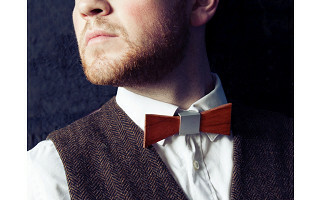 I posted the "wooden tie" on FB; I hope it catches on! Esp after Hurricane Sandy in NJ shore area; this sort of makes a statement about preservation after surviving the superstorm. I'd suggest selling in NJ with a donation towards recovery efforts already underway. Many of us are finding our homes condemned due to a single beam having been broken by the water. As a woman, I'd be interested in a wooden belt. I gave a tie to my grandson when he graduated from 8th grade. He loved it! But before he could wear it, one of the family Golden Retrievers jumped up on his bed and chewed up the tie. My grandson never got to wear it. I am ordering another one for him for Christmas. I hope he has better luck with the second one. @Paula Englert Paula, i too hope your grandson gets to use it before he lets the dog after it. It's a fun product that makes a great gift. Maybe you can get the Golden something from our pets section. Does your tie have a past life? Wood ties from the craftsmen at Wood Thumb in San Francisco do -- maybe as a beam holding up a barn, floorboards from an old warehouse, or siding from a dismantled sawmill. Founders Christopher and David Steinrueck put their creativity and inspiration to good use, turning waste materials into wearable products. 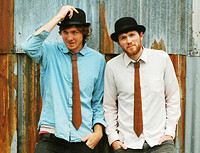 From a neglected old redwood beam, sitting in a salvage yard, the two brothers created their first wood neckties. Wood Thumb ties are lightweight and flexible, held together by a cord that runs through the segments of the tie and around the shirt collar. Nail holes and rust spots add character and hint at the storied history of the salvaged wood.